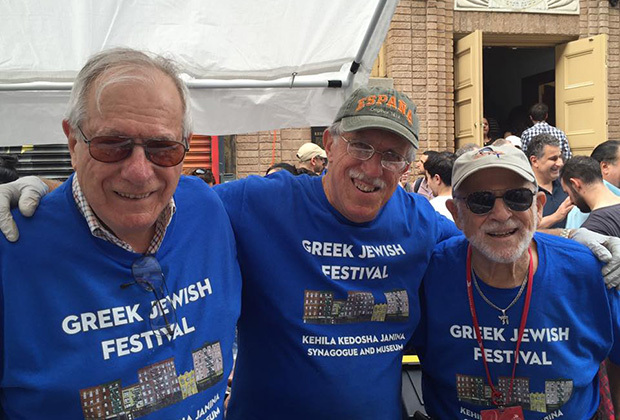 Home > June 2016 > 2nd Annual Greek-Jewish Street Festival in NYC an Astounding Success! 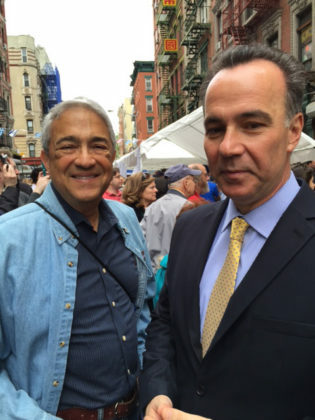 2nd Annual Greek-Jewish Street Festival in NYC an Astounding Success! 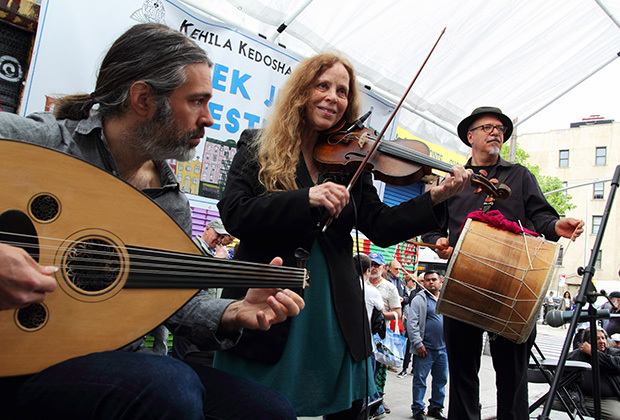 This past May, Broome Street between Allen and Eldridge on the Lower East Side of Manhattan vibrated with the sounds of the bouzouki and the clarinet as Kehila Kedosha Janina (the Greek Synagogue) celebrated its second Greek-Jewish Street Festival. As the crowds lined up for bourekia, Greek salad, mezedes, koulouria and baklava, the street where so many Greek Jews had once lived at the beginning of the 20th century once again resounded with the melodies of Ladino and Greek music. Joining in the celebration were the new residents of Broome Street; Asian and Spanish. With the tenements as a backdrop, the crowd danced to rebetika, pontiakos, hasapiko, kalamatianos and, of course, belly dancing. From the early 20th century through the 1940s the corner of Broome and Allen was the center of Balkan Jewry as they shared their new-found stake in New York City with thousands of other immigrants who had left their homelands to find opportunities in the New World. Sharing the streets of the Lower East Side with Jews from Eastern Europe and Greeks and Italians from southern Europe, the Greek-speaking Jews from Ioannina and other Romaniote communities in Greece found a niche for themselves, building their own synagogue at 280 Broome Street. Kehila Kedosha Janina still stands today, now a Historical Landmark in the city of New York and a magnet for tourists throughout the year. On May 22nd, Greek Jews in New York once again made history as the crowd swelled to over 6000. What was especially beautiful about the Greek-Jewish Street Festival was that they shared their traditions, customs, music and food with their neighbors. It was great to see how our culture reverberated among so many non-Greeks! Joining the May 22nd event were Greek-Jews from all over the country. Those whose families once lived in the tenements flocked to the Lower East Side, meeting family and friends to share the world they so loved. Many used the event as a family reunion, as descendants from our founding families filled the streets. We had many whose families once lived in the tenements on the Lower East Side, including Negrins, Colchamiros, Askinazis, Mordos, Matsils, Matzas and Battinos. They proudly pointed to the windows of the tenements where their Nonas (Grandmothers) once looked out to call them in for dinner. Adding to the joy were our Greek-Orthodox Christian friends, including those from St. Barbara’s on Forsythe, showing how much we share in common. 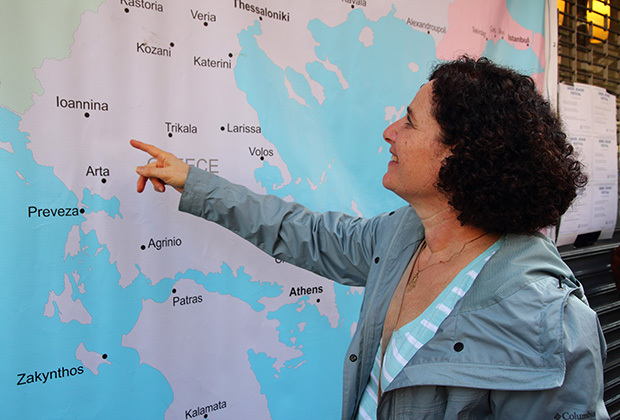 One of the busiest sections of the Festival (after the food and dancing, of course) was the Map of Greece where visitors could take pictures pointing to the city their family came from. Of course, Ioannina was the most popular location. Among the many visitors were dignitaries from the municipal government. We were also honored with the presence of the new Consul General of Greece in New York, Konstantinos Koutras and the Consul of Greece, our dear friend Manos Koubarakis. The synagogue and museum were packed with visitors for our free tours. Volunteers, including Stuart Chernin, whose mother was the only member of her Cohen family from Ioannina to survive the Holocaust, gave a specialized tour, not only telling the story and history of Kehila Kedosha Janina but, also fitting his family’s special story into the picture. Ilias Hadjis, born in Volos and a member of Kehila Kedosha Janina since his family’s arrival in New York in 1956, told his special story of survival as a hidden child during the Nazi Occupation. These are examples of why our community and museum are so important to visitors. It gives them a glimpse into a world they never knew existed, the world of Greek-speaking Jews. Some examples of the attractions that greeted the many visitors were tattoos for children (including the Greek Flag), Sara Aroeste, a talented Ladino performer who created a Ladino music CD for children to learn Ladino (Medieval Castillian Spanish, the language of Sephardic Jews), and a table packed with books and gift items for sale (all having to do with Greek Jewry). There were also venders who displayed their wares. Among the venders were our friends from St. Barbara’s, the Pickle Guys, Italian Ices, the Greek-Jewish Young Professionals selling t-shirts, and a display of handmade Venetian glass. The musicians who shared the stage for six hours of continuous music were Elias Ladino Ensemble, Pontic Firebird, Noga Group, New York Andalus Ensemble and Rebetika with Mavrothi Kontanis. The expressions of joy on the faces of those who walked our street and danced to the music said everything. We always knew what a special world we belonged to. Now so many others share this knowledge. There were also local organizations and sponsoring groups who joined us a tables, making this a Lower East Side event, in addition to a Greek-Jewish event. Representatives from the Tenement Museum and the Lower East Side Preservation Initiative spoke of their love for the Lower East Side and the American Friends of the Jewish Museum of Greece informed the crowd of the Jewish Museum in Athens. The initiative for the Greek-Jewish Street Festival came from our youngest Board member, Andrew Marcus, whose family came from Verroia and Turkey. Growing up in a traditional Sephardic world and a member of Kehila Kedosha Janina since his birth, Andrew was impassioned with the distinctive culture of Greek Jewry. Having attended so many Greek festivals with his father, Marvin Marcus, President of Kehila Kedosha Janina, he envisioned having a Greek-Jewish Festival on Broome Street in front of the synagogue. Last year, 2015, was the first year for the festival and at least 2000 visitors showed up. It was feared that this year would not be as successful. Thanks to the many volunteers from the community, it was even more successful and the attendance was tripled. Plans are in place to make this an annual event but we may have to expand it, adding an additional block to accommodate the crowds. To date, this festival is the only Greek-Jewish Festival in the United States. Hopefully, that will change but we will always be the first. Marcia Haddad Ikonomopoulos is Museum Director at Kehila Kedosha Janina.